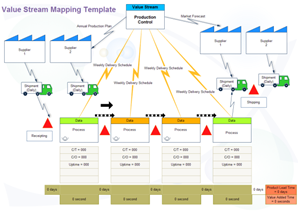 Value stream map is a visual means to depict and improve the flow of manufacturing and production process, as well as the information that controls the flow of materials through the process. Many lean practitioners see value stream mapping as the fundamental tool to identify waste, reduce process cycle times, and implement process improvement. On this page, we've carefully collected some quality value stream map examples which are fully editable. Through Edraw Max, all the templates can be easily customized, just download and add own texts, resize or move shapes, add pre-drawn clip arts and change color and line styles. A presentation-quality value stream map will be done in just minutes. When it's done, you can easily print or export the diagrams to PDF, Microsoft word, excel, ppt formats, or save them as images. Click here to see how to print and export value stream map files. You can use this ready-made template together with extensive value stream symbols in Edraw to make quality value stream maps. Click the download links below this picture to save the template. Both PDF and EDDX formats are available. A schedule value stream map template is prepared for anyone on request. Try this vector file to ease your drawing process. A production control value stream map is well prepared to benefit our users, which is in vector format and allowed to edit. 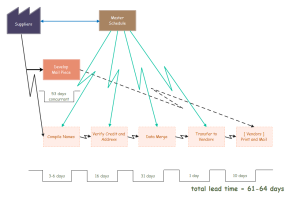 A well-designed value stream template is available in vector format. Take it to assist your value stream map designs. 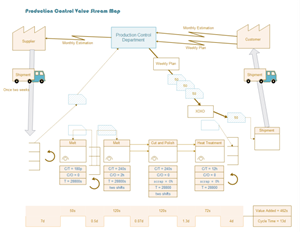 This production control value stream map example is shown here as a demo. 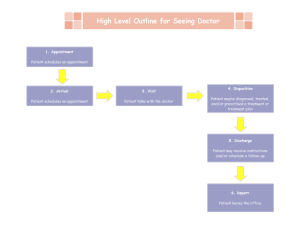 You can download the original file and edit to make a new value stream map. To help users better understand value stream map and develop outstanding value stream map diagrams, we've also prepared some relative materials for users to study. If you want to learn about each symbol meaning and usage, please check the Value Stream Map Symbols page for a detailed explanation of different symbols. If you want to study related value stream map terms and concepts, please read Understanding Value Stream Map and Related Concepts. If you don't know the effects and benefits of using a value stream map, please go to Benefits of Using Value Stream Map for further information. If you want to have more value stream map examples, you can go to value stream map gallery for more resources. 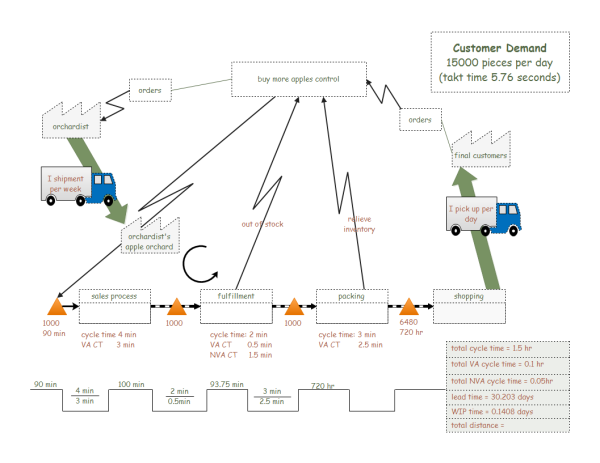 Discover why Edraw is an excellent program to create value stream map. Try Edraw FREE.